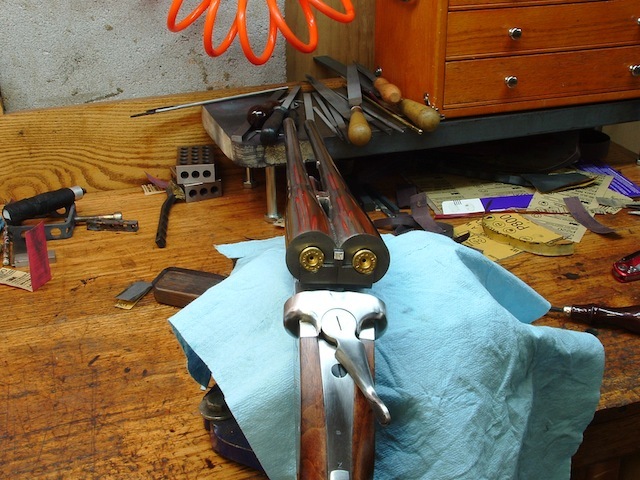 Steven Howell's double rifle. Read and learn--as did I. Sure, you can put the photos on your site. I took a series of photos during the building of the rifle barrels as I had never built a shoe lump set of barrels before and if you like I can send you several e-mails with photos attached and you can decide what you want to use. I am not certain that any other person in the USA has attempted to build a set of DR barrels on the shoe lump method. It was a significant emotional event for me to tackle this and set me back 3-4 months on schedule as I had to teach myself how to build these and correct the errors till I was able to make a shoe lump perfectly. The DR weights 7 lbs 15 ounces without the ribs. The barrels are 22 1/2" in length and I spent weeks in getting them balanced and to the light profile I wanted. The barrels together with the lumps, fore-end loop and muzzle collar weight 4lbs 4 ounces. 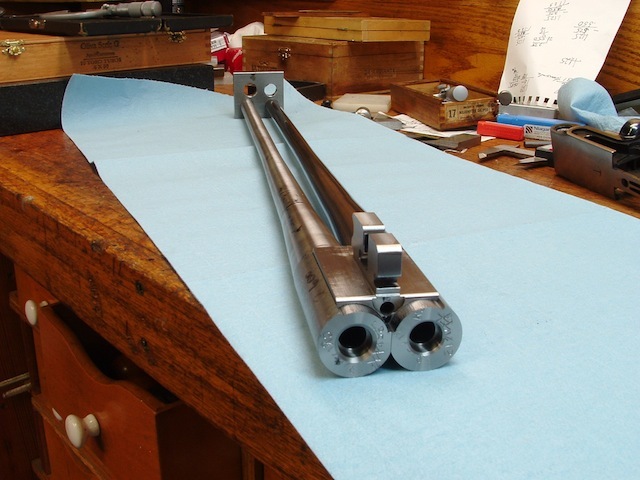 I started with two barrel blanks that weighed 5 lbs each, and the shoe lump began as a 2" diameter round bar of 4140 alloy steel 2 1/2" long weighing 2 lbs. 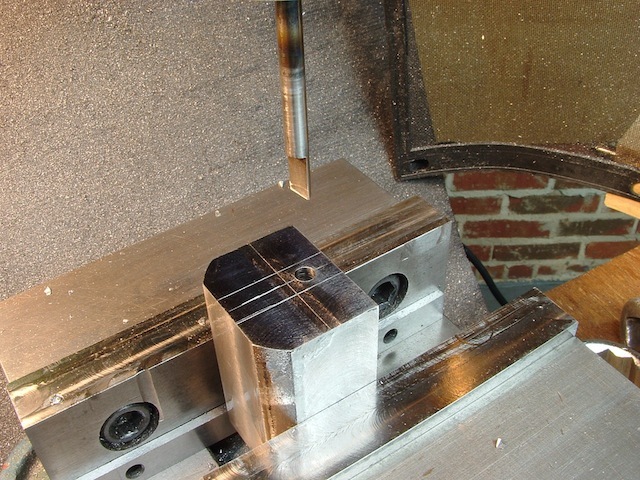 After machining, the lump weighed 4 ounces requiring several days of work. I plan on the DR weighing in with scope, Talley QD rings, ribs, ramps and so forth at 9lbs. 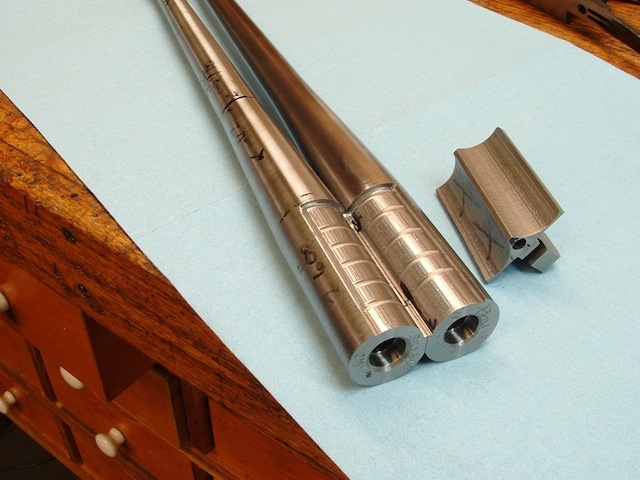 The barrels are 4140 alloy steel as well with .367/.377" bore/groove diameter. The cartridge is near the standard .38-55 size and wall thickness, except that the cartridge length is 2.125" versus about 2.080" of most .38-55 cartridges manufactured today. M.L. 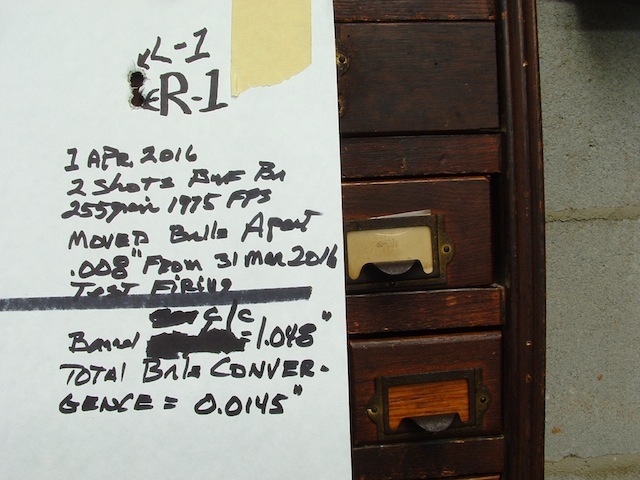 McPherson, a sporting firearms author and sportsman and I suppose ballistics expert developed this longer case for better accuracy a few years back. Due to the extra length and therefore propellant capacity, the cartridge case can be loaded to meet the ballistics of the .375 Winchester with only 38,000 or so psi chamber pressure, versus the 52,000 psi chamber pressure of the .375 Winchester round (brought to the market by Winchester in the late 1970's). To my mind this makes a wonderful cartridge for a light DR, because the cartridge can be handloaded to take all the large non-dangerous game in North America; and it can be loaded with pointed or round tip bullets since it is used in a DR. 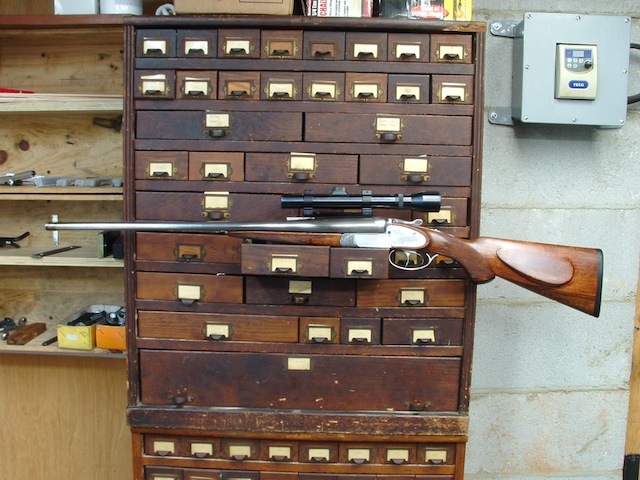 The .38-55 is one of those "sleeper" cartridges that can be loaded to equal the original circa 1890 H&H 2 1/2" flanged nitro express that even took elephants before the real cartridges were developed by the Brits. I would not want to try them on elephants. The loading of such heavy loads in the .38-55 cases is the reason my rifle has a bit over 1 inch diameter barrels at the breech end. The recoil on this rifle so far is about like my 1954 M/S .270. 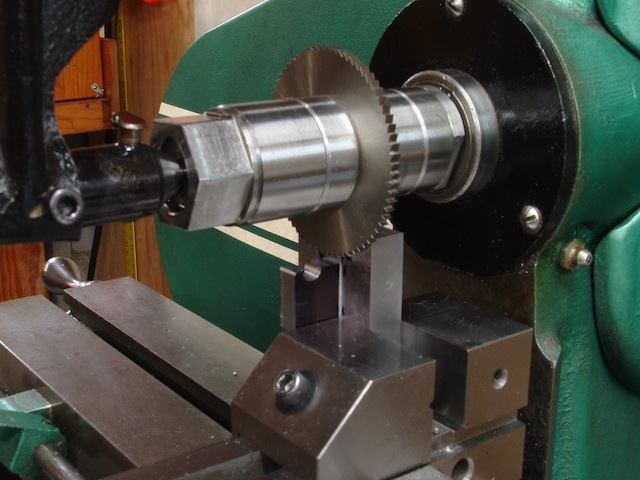 Attached are a couple more photos of starting the machining process as well as a link to Verney-Carron video showing how they make shoe lump barrels. The youtube video is in French, but you will have no trouble knowing what is happening. Pay close attention to the brazing of the barrels to the shoe lump as this is how I did my DR as well. Good shooting on your turkey hunt, I may go later on this week myself, 15 minutes away to my daughters farm. Thank you for your interest in my work. Also, since I retired 8 years ago I have learned to engrave and I will later engrave the DR. I will attache a photo of some of the engraving on the first DR I built. Turnbull did the case coloring for me. Thanks for the email Stephen. I'm impress with your work (I don't even turn a screw on my doubles I have so little skill). From the barrel thickness at the breach I'm curious about the weight. Of course no recoil will be felt. Is the cartridge the standard .38-55 WCF, or close to it? I'm in the states to hunt turkey and will be home in early May. Can I put your pics on my website? Last year I decided to build another DR for myself and that this one would be a .375 2 1/2" flanged NE. However, after looking a ballistics and the availability of 2 1/2" flanged cases, I decided to build a rifle in .375 that I could load to same or similar ballistics to the 2 1/2" flanged NE. 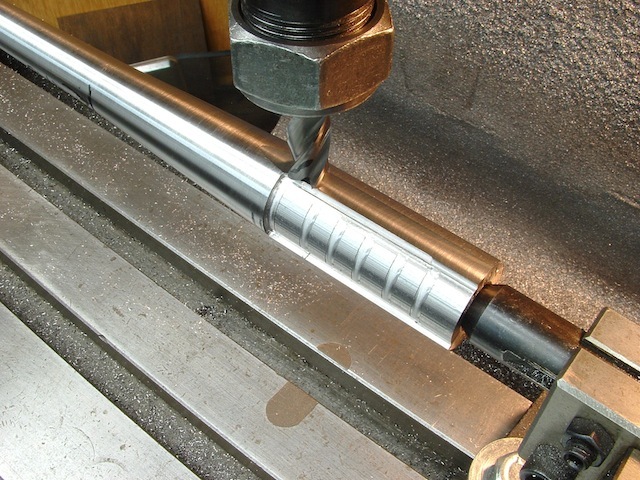 The cartridge is the 2 1/8" .38-55 McPherson with new cases being made by Star and chamber reamers by Pacific. Buffalo Bore already makes a 255 gr Heavy .38-55 with velocity of 1950 fps. Hawk Bullets of Salem, NJ have made some custom order .375" 250 gr Round Tip bullets to my specification for this DR, which have only a 0.025" thick soft copper jacket. This should cease the problem that .375 shooters have with poor to no expansion of bullets under 2,200 fps velocity. I also decided to build the barrels using the dog lump process famed by Heym and Verney-Carron and to also build the lumps where the face of the rear lump will lock up tightly against it's mating surface of the action ( the "draw") and remove the pressure from the hinge pin (about 0.003") during firing. I have done all this and the rifle works very well and more importantly shoots very well in the preliminary regulation. I am in the process of fitting the ribs and quarter ribs as well as the sights and ramp. I hope to have the DR ready by end of this month to start the engraving. Here are some photos that I thought you would have interest in seeing of the DR as well as my shop. I am retired from the heavy engineering and construction business (Fluor Corp), having lived and worked in South Africa and the UK.